During his keynote speech at the 2004 Democratic National Convention, Barack Obama introduced himself as a skinny kid with a funny name. The rising star of Illinois politics was elected to the U.S. Senate three months later. Obama is the third African American to serve in the Senate since Reconstruction. Barack Obama was born in 1961 and raised primarily in Hawaii. His father was from Kenya, his mother from Kansas. Obama graduated from Harvard Law School and was the first black person elected president of Harvard Law Review. Before becoming a state senator, Barack Obama worked as a community organizer on Chicago's south side and practiced civil rights law. He taught Constitutional law at the University of Chicago. In one campaign speech, Obama told his audience why someone with his elite credentials would go into the gritty field of politics (a question he was often asked). Obama replied, "We've got too much cynicism in this country, and we're all in this together, and government expresses that." 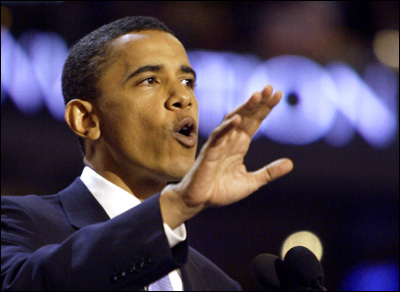 In this 2004 keynote address, Barack Obama returned to these themes. Tonight is a particular honor for me because, let's face it, my presence on this stage is pretty unlikely. My father was a foreign student, born and raised in a small village in Kenya. He grew up herding goats, went to school in a tin-roof shack. His father — my grandfather — was a cook, a domestic servant to the British. While studying here, my father met my mother. She was born in a town on the other side of the world, in Kansas. Her father worked on oil rigs and farms through most of the Depression. The day after Pearl Harbor my grandfather signed up for duty; joined Patton's army, marched across Europe. Back home, my grandmother raised their baby and went to work on a bomber assembly line. After the war, they studied on the G.I. Bill, bought a house through F.H.A. [The Federal Housing Administration], and later moved west all the way to Hawaii in search of opportunity. They stand here, and I stand here today, grateful for the diversity of my heritage, aware that my parents' dreams live on in my two precious daughters. I stand here knowing that my story is part of the larger American story, that I owe a debt to all of those who came before me, and that, in no other country on Earth is my story even possible. Tonight we gather to affirm the greatness of our nation — not because of the height of our skyscrapers, or the power of our military, or the size of our economy. Our pride is based on a very simple premise, summed up in a declaration made over two hundred years ago: "We hold these truths to be self-evident, that all men are created equal. That they are endowed by their Creator with certain inalienable rights. That among these are life, liberty and the pursuit of happiness." That is the true genius of America — a faith in simple dreams, an insistence on small miracles. That we can tuck in our children at night and know that they are fed and clothed and safe from harm. That we can say what we think, write what we think, without hearing a sudden knock on the door. That we can have an idea and start our own business without paying a bribe. That we can participate in the political process without fear of retribution, and that our votes will be counted, at least most of the time. This year, in this election, we are called to reaffirm our values and our commitments, to hold them against a hard reality and see how we are measuring up to the legacy of our forbearers, and the promise of future generations. And fellow Americans, Democrats, Republicans, Independents — I say to you tonight: we have more work to do. More work to do for the workers I met in Galesburg, Illinois, who are losing their union jobs at the Maytag plant that's moving to Mexico, and now are having to compete with their own children for jobs that pay seven bucks an hour. More to do for the father that I met who was losing his job and choking back the tears, wondering how he would pay $4,500 a month for the drugs his son needs without the health benefits that he counted on. More to do for the young woman in East St. Louis, and thousands more like her, who has the grades, has the drive, has the will, but doesn't have the money to go to college. Now don't get me wrong. The people I meet — in small towns and big cities, in diners and office parks — they don't expect government to solve all their problems. They know they have to work hard to get ahead. And they want to. Go into any inner city neighborhood, and folks will tell you that government alone can't teach our kids to learn. They know that parents have to teach, that children can't achieve unless we raise their expectations and turn off the television sets and eradicate the slander that says a black youth with a book is acting white. They know those things. You know, a while back, I met a young man named Seamus in a V.F.W. Hall in East Moline, Illinois. He was a good-looking kid, 6'2", 6'3", clear-eyed, with an easy smile. He told me he'd joined the Marines, and was heading to Iraq the following week. And as I listened to him explain why he'd enlisted, the absolute faith he had in our country and its leaders, his devotion to duty and service, I thought this young man was all that any of us might hope for in a child. But then I asked myself: Are we serving Seamus as well as he is serving us? I thought of the 900 men and women; sons and daughters, husbands and wives, friends and neighbors, who won't be returning to their own hometowns. I thought of the families I've met who were struggling to get by without a loved one's full income, or whose loved ones had returned with a limb missing or nerves shattered, but still lacked long-term health benefits because they were Reservists. When we send our young men and women into harm's way, we have a solemn obligation not to fudge the numbers or shade the truth about why they are going, to care for their families while they're gone, to tend to the soldiers upon their return, and to never ever go to war without enough troops to win the war, secure the peace, and earn the respect of the world. Now let me be clear. Let me be clear. We have real enemies in the world. These enemies must be found. They must be pursued, and they must be defeated. John Kerry knows this. John Kerry believes in America. And he knows that it's not enough for just some of us to prosper. For alongside our famous individualism, there's another ingredient in the American saga: a belief that we're all connected as one people. If there is a child on the south side of Chicago who can't read, that matters to me, even if it's not my child. If there's a senior citizen somewhere who can't pay for their prescription drugs, and [has] to choose between medicine and the rent, that makes my life poorer, even if it's not my grandparent. If there's an Arab American family being rounded up without benefit of an attorney or due process, that threatens my civil liberties. Now even as we speak, there are those who are preparing to divide us, the spin masters, the negative ad peddlers who embrace the politics of 'anything goes.' Well, I say to them tonight, there is not a liberal America and a conservative America; there is the United States of America. There is not a Black America and a White America and Latino America and Asian America; there's the United States of America. I'm not talking about blind optimism here - the almost willful ignorance that thinks unemployment will go away if we just don't think about it, or the health care crisis will solve itself if we just ignore it. That's not what I'm talking about. I'm talking about something more substantial. It's the hope of slaves sitting around a fire singing freedom songs. The hope of immigrants setting out for distant shores. The hope of a young naval lieutenant bravely patrolling the Mekong Delta. The hope of a mill worker's son who dares to defy the odds. The hope of a skinny kid with a funny name who believes that America has a place for him too. Hope in the face of difficulty. Hope in the face of uncertainty. The audacity of hope. In the end, that is God's greatest gift to us, the bedrock of this nation. A belief in things not seen. A belief that there are better days ahead. America! Tonight, if you feel the same energy that I do, if you feel the same urgency that I do, if you feel the same passion I do, if you feel the same hopefulness that I do — if we do what we must do, then I have no doubt that all across the country, from Florida to Oregon, from Washington to Maine, the people will rise up in November, and John Kerry will be sworn in as president, and John Edwards will be sworn in as vice president, and this country will reclaim its promise, and out of this long political darkness a brighter day will come.